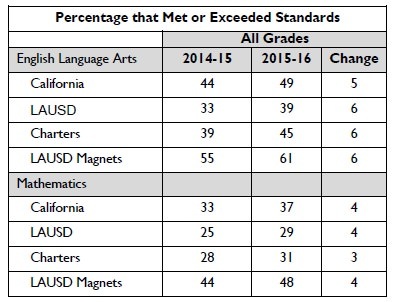 Los Angeles Unified’s popular magnet centers and schools outscored independent charters by double-digit margins on California’s new state assessments, and also beat statewide averages on the rigorous math and English tests, according to data released today. In the analysis of the Smarter Balanced Assessments, 61 percent of magnet students met or exceeded standards in English-Language Arts (ELA), compared with 45 percent of independent charter students. On the math assessments, 48 percent of magnet students met or exceeded standards, while 31 percent of independent charter students hit those marks. “This is another accomplishment to celebrate as we move closer to our goal of preparing all of our graduates for success,” said Superintendent Michelle King. Statewide, an average of 37 percent of students met or exceeded standards on math assessments, as did 49 percent on ELA tests. In traditional District schools, 29 percent of students met or exceeded math standards and 39 percent performed at that level on the English exam. Magnets made across-the-board gains over their scores for 2015, when they outperformed independent charters and traditional schools. L.A.Unified currently has 214 themed magnet centers or free-standing schools, with plans to add or expand at least 13 more in 2017. The themes include business, communications, the increasingly popular STEM – science, technology, engineering and math – and programs for gifted students. Click here to read the full story on LAUSD Daily. And click here to read LA School Report’s three-part series on magnets.